This is the damage a 19-year-old college swimmer inflicted on her boyfriend when he said he wanted to break up. After he was assaulted by his girlfriend last week, Fairfield University student-athlete Kathryn A. Mahoney, Ben Kebbell took to Snapchat to update friends on his condition. Kebbell, who is also on the school's swim team and hails from the Isle of Man in the UK, appeared to be in good spirits and even joked about his injuries. 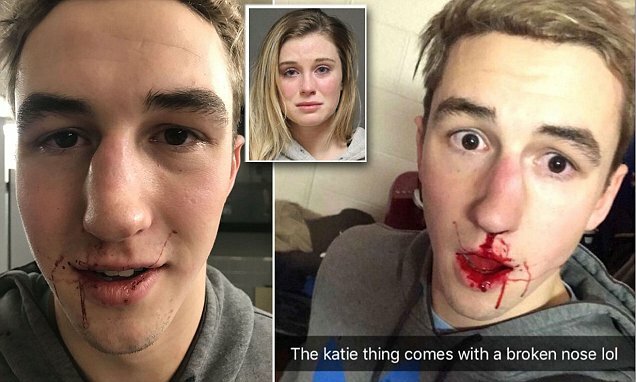 'The katie thing comes with a broken nose lol,' the six-foot-one, 184-pound athlete wrote on one picture, showing blood streaming out of his nose and into his mouth. In a later picture, the freshman smiled after some of the blood had been cleaned off of his face.